Minyinga showed appreciation for the shorter race distance when she scored a last stride win at Seymour on Monday. “To be honest, I thought she had got beaten on the line,” Damien said. Clayton Douglas who rode second-placed My Mother Says thought he had hung on to beat Minyinga who has now won three of her 13 starts. Her other wins were at Geelong over 1300 metres in September 2017 and 1400m at Werribee in January this year. 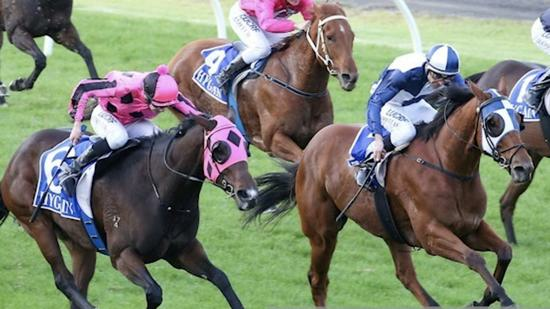 Trainer Jamie Edwards said 1400 metres seemed to be Minyinga’s optimum distance. “Being out of a Street Cry mare we tried her over 1750 metres two weeks ago, but she didn’t quite run it out,” Jamie said. He said there was some concern coming back in distance so quickly, but he had given Minyinga one short uphill gallop at the farm to freshen her. “Normally you would like to give a horse a month between runs when bringing them back in distance but that’s the beauty of having the farm,” Jamie said. The blinkers gave her extra focus for the 1400 metres. Minyinga raced midfield, three-wide with cover, and made an early move four-wide approaching the 600 metres. She was even wider into the home straight and finished outside the middle of the track after laying out under pressure.